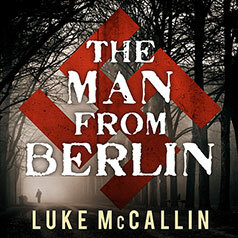 Luke McCallin combines historical fiction and mystery in this intriguing novel set in Sarajevo during World War II. In war-torn Yugoslavia, a beautiful young filmmaker and photographer—a veritable hero to her people—and a German officer have been brutally murdered. Assigned to the case is military intelligence officer Captain Gregor Reinhardt. Already haunted by his wartime actions and the mistakes he's made off the battlefield, he soon finds that his investigation may be more than just a murder, and that the late Yugoslavian heroine may have been much more brilliant—and treacherous—than anyone knew. Maneuvering his way through a minefield of political, military, and personal agendas and vendettas, Reinhardt knows that someone is leaving a trail of dead bodies to cover their tracks. But those bloody tracks may lead Reinhardt to a secret hidden within the ranks of the powerful that they will do anything to keep. And his search for the truth may kill him before he ever finds it.